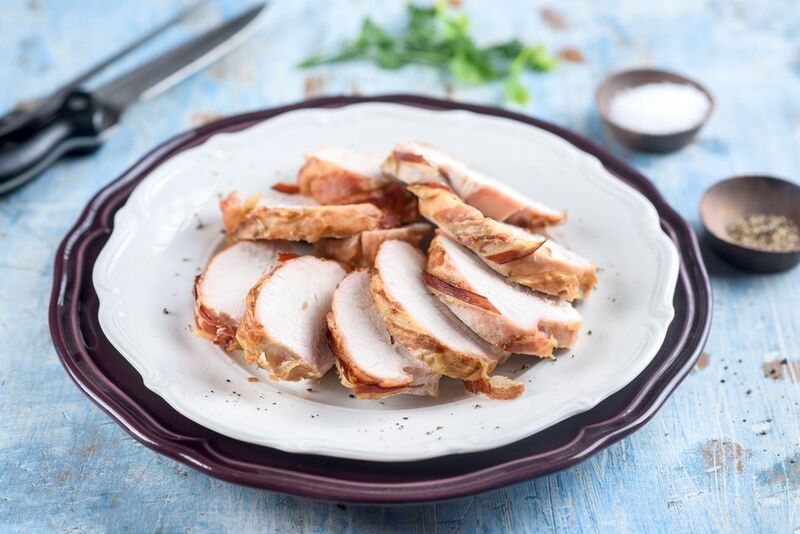 Roasted bacon turkey tenderloin is a flavorful and easy main dish recipe perfect for entertaining. It only uses two ingredients, which means it is super quick to make and easy enough for beginning cooks. Partially cook the bacon in a large skillet over medium heat until some of the fat is rendered. Drain the bacon on paper towels for a few minutes. Season the tenderloin with the salt and pepper to taste. Wrap the bacon around the tenderloin crosswise and fasten with toothpicks. Place a wire rack in a roasting pan and place the wrapped turkey on the rack. Roast the turkey tenderloin for 40 to 45 minutes or until the turkey registers 160 F using a good and reliable meat thermometer. Cover the pan with foil and let stand for 10 minutes. Slice the turkey into slices to serve, cutting each slice so it is wrapped with a piece of bacon. Discard the toothpicks. Make sure you buy really good quality bacon and turkey tenderloin for this recipe—because there are only two ingredients, they must be of stellar quality. You can, of course, add other ingredients to this recipe. For a kick, coat the tenderloin with mustard before wrapping it in bacon. You could also sprinkle the meat with herbs or spices before you add the bacon. Or roll the whole thing in some brown sugar after wrapping the bacon around the meat, for a glazed bacon turkey tenderloin.